I wanted to post this slow cooker recipe, in time for Cinco de Mayo. I saw this recipe on Pinterest, and when I saw Lime chicken, and I was in. 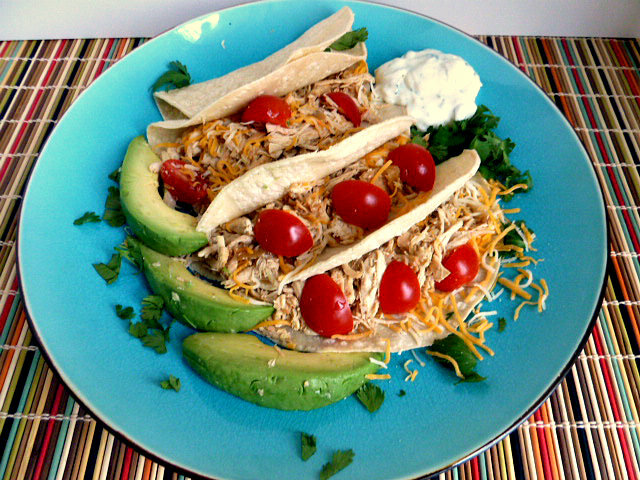 You can cook frozen chicken breasts for the tacos in the slow cooker earlier in the day, shred the chicken, assemble your toppings, and serve, easy peasy. There was a recipe to make your own taco seasoning, but I used a salt free Adobo seasoning from the The Spice House. The salt-free Adobo seasoning, which I love, had almost the same ingredients as the recipe here. I served the tacos with avocado slices, cherry tomatoes, and shredded Mexican cheese along with Lime Crema I made the Lime Crema with Greek yogurt, which make it more figure friendly, and lots of fresh lime zest and juice with a little cumin, mixed in for good measure. You can switch up the toppings and tortillas to any of your favorites; guacamole, cilantro, hot peppers, corn tortillas, etc. These tacos were amazing with the spicy chicken, and cool Lime Crema on top. We are making these again for Cinco de Mayo, Sunday May 5th, Ole., and I hope that you make the wonderful tacos, too. See more Cinco De Mayo recipes on my Pinterest -Cinco de Mayo page. 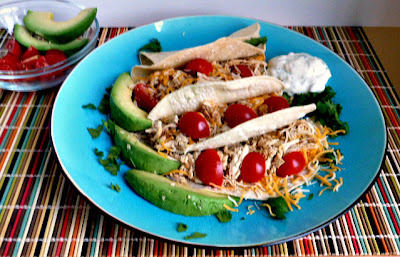 I made this wonderful taco recipe recently with a hectic week of Dr. appointments for Scott. Here is a quick update on our medical journey. Even though Scott's Pituitary tumor is large and will require surgery, it is slow growing, and probably benign. We feel better now that we have a plan, and are waiting for a call back from a Neurosurgeon in Chicago. We are nervous, but trying to focus on the positives, and follow the plan. 3-4 pounds of chicken breasts, bone-in and skin on – I used frozen boneless skinless breasts and halved the recipe for two of us. Combine all of ingredients in airtight container. Place the sliced onions in the bottom of your slow cooker. Squeeze the juice of one lime over the onion. Then place the chicken on top. Sprinkle 2 T. of taco seasoning over the top of the chicken; turn chicken over and sprinkle remaining tablespoon of seasoning. Squeeze the juice of the remaining two limes over chicken and onion. Add the broth. Cover and cook on high for 3 1/2 to 4 hours. These tacos are so good with spicy chicken, and cool Lime Crema. A perfect cinco de Mayo dish! Lots of great flavors in these tacos, including lime. We use lime in Mexican food, tuna salad, chicken dishes, drinks, and many more. Awesome!!!!! Looks so light too! These tacos are a lightened version, and taste so good. Tasty and lip-smacking I'm sure. All kinds of ingredients in her I like. So glad you guys are staying positive and working a plan. Hopefully you will know more soon. Hope you aren't wearing yourself out running around. Been thinking about you guys. Lots of flavors and ingredients make for an incredible dish. Not your everyday tacos. We are trying to stay positive through this journey. Thank you for your thoughts. That is wonderful! You even made seasoning yourself?! I didn't make the Taco seasoning myself because the salt-free Adobo seasoning that I I had contained most of the ingredients in the Taco seasoning. Either way, these tacos are so good. What a great recipe. I love all the flavors here! Hi Becky, just love, love your colorful, flavorful and healthy, yummy, and light chicken tacos. We're having a huge Cinco de Mayo celebration here, in S. Florida with it's huge Spanish community, especially in Miami! I left a reply to you on my blog re: the PC situation. Thanks for your helpful advise! Thank you for your sweet words. I imagine the Cinco de Mayo celebration in S Miami is something not to be missed.